I’ll always be a California girl, and even though I’ve lived in Maryland for years now, the place that I call home has to appeal to the granola-eating, eco-conscious hippie in me. Fenwick Station, a LEED Gold, six-story multifamily residential building in downtown Silver Spring, definitely fits that bill. 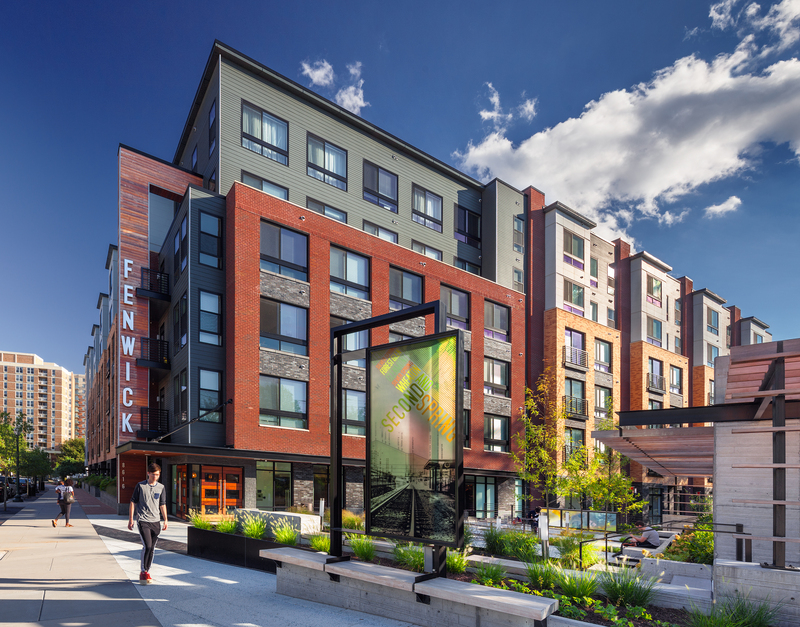 Certified under LEED BD+C: New Construction, the Fenwick connects the Woodside neighborhood, Silver Spring Central Business District and public transportation hubs. Sustainable features are integrated into the property, creating a unique and inviting place to live. Silver Spring, like its neighbor Washington, D.C., is a hotbed of green buildings and infrastructure, including LEED- and Parksmart-certified buildings; Montgomery County alone has 190 LEED-certified projects. In this area, you can find competitively priced green apartments within walking distance of shops, restaurants, entertainment and parks. 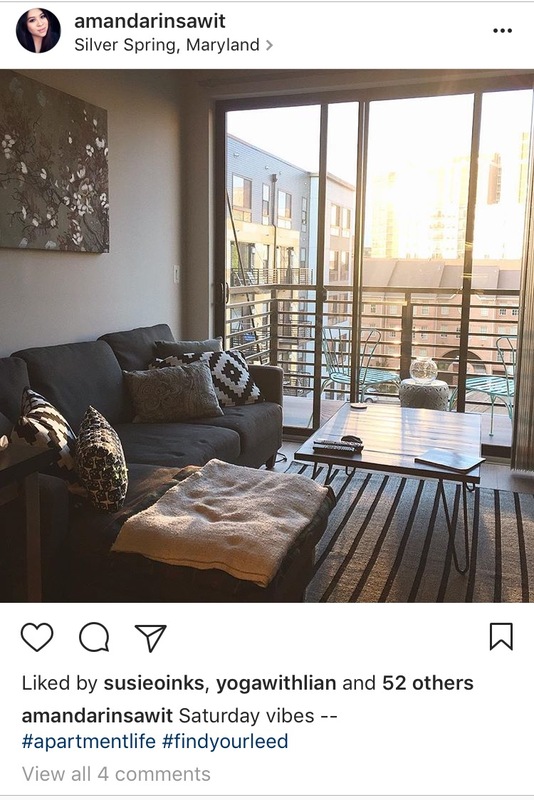 After facing rent increases at my last building, I was pleasantly surprised to find out that I could pay less per month and live in a beautiful building in the same neighborhood. Score. Photo and feature image credit Max Zhang Photography. Making the decision to live at the Fenwick was easy because it looks good. Beyond the fine finishes of the interior décor, the building also features colorful murals, sculptures and art installations from local artists. The amenities spaces—club room, gym, courtyard and pool, roof terrace, library and meeting areas—all flow into one another, so it feels like it’s one big communal space. The intention was to design artful, inviting and engaging social places, and to select materials—such as wood, steel, decorative concrete and resin graphic panels—that evoke a sense of authenticity and craftsmanship in the way they age. Inside the units, big windows let in lots of daylight. Modern design and Energy Star stainless steel appliances set a clean tone for the living spaces, and eco-friendly carpet runs through the bedrooms. When I moved in, I felt an urgent need to declutter my life and donate or repurpose the literal baggage that I’d schlepped from apartment to apartment. The Fenwick is accessible by multiple walking and bike paths and is a five-minute walk to the Silver Spring Metro station, MARC train station and bus transit hub. I don’t own a car, so it was important for me to access multiple modes of transportation from my doorstep. At USGBC, we emphasize transit-oriented design for green buildings—and as someone who grew up in the suburbs driving everywhere, I do feel it improves quality of life to have freedom to move, without being tethered to the cost of a car. Each residence is decked out with pretty, energy-efficient appliances, and water fixtures in the bathroom are minimal flush and flow (yes, the water pressure is slightly less, but that’s a reasonable compromise.) This not only helps me conserve water, but also energy, which is individually metered by the local utility. I manage the temperature of my apartment using the utility panel in my home, as well as online through the utility’s website, which helps reduce cost. My average electric bill is about $60 cheaper than average for a comparable unit, and my biggest electric expense goes to heating water (can’t live without those hot showers.) While I was always pretty conscious about conserving resources, having easy access to the information has motivated me to find more opportunities to scale back usage. The landscaping around the building is also full of life. This project was one of the first in the area to implement the county’s stringent stormwater management regulations on a tight urban site, driving creative solutions that integrate those needed facilities and ultimately gave the building its distinct, green look. Native greenery has been woven into the architecture, streetscape, amenity courtyard and roof terrace using the same materials and detailing as the rest of the building. The plant palette also supports native insect and bird habitat, and the green roof was designed for a variety of sun exposures and seed dispersal methods for continuous regeneration and climatic adaptation. I’ll take this surrounding over a concrete jungle any day. The bottom line: my building fits my life. I don’t have to travel far on foot or bike to see friends, shop at the local farmer’s market, see a concert at the Fillmore or hit up a 7-Eleven for a taquito. Like many who work in sustainability, I know that my ability to contribute doesn’t end when I leave the office. I am fortunate to be able to choose where I live, and as more renters decide to put their dollars toward residential buildings like the Fenwick, sustainable housing will not just be preferred in the marketplace, it will become the norm.